There is something completely enthralling watching an individual master a particular craft. One can tell when someone is in the zone, unfazed, and immersed intensely and maddeningly in their passion. The world these gifted individuals tend to inhabit seems to be completely their own. They make it their own. Outside distractions aren’t capable of obstructing their goal or their code they swear by. In the end, they will have obtained what they have strove for. Le Samouraï (1967) is an exact depiction of this sacred and all too rare state of mind. This film is an ideal pairing between creator and his subject. Jean-Pierre Melville, the film’s director and screenwriter, achieves this in his spotless direction of a masterful hitman named Jef Costello (Alain Delon) who is knowingly aware that the path he is on will lead to his eventual demise, and yet, unequivocally, he proceeds. Le Samouraï opens by presenting its viewers with a cavernous room with gigantic ceilings, and a bit of smoke emanating from one side of it. This seems to evoke a spacious and extremely religious mausoleum. Slowly, though, we see some movement. A man rises up where the smoke is. It is Jef. His gestures are comparable to those of the somnambulist in the silent horror film The Cabinet of Dr. Caligari. He puts out his cigarette, feeds his bird, and meticulously adjusts the brim of his impeccable fedora just prior to him leaving his apartment. How many times before did he do the exact same routine? The idea to start the film with this initial scene is deliberately meant to recall a funeral parlor, making us aware that death is patiently hovering over this man’s life. He’ll succumb to it, but not quite yet. There is an attractiveness and a romantic allure to a man who hardly loses his composure despite him knowing the tragic fate awaiting. The west was just getting acquainted with some of the golden samurai films from Japan (i.e. 1962’s Harakari) that maintained a man’s strict adherence to a personal code. There are some incredible interviews on the Criterion Blu-ray edition of this film detailing the influence of Japan’s samurai films. One of them recalls Melville meeting with Delon in Delon’s apartment. Melville explains Le Samouraï‘s roots and reads to him the first seven to eight minutes of the script to the film, which didn’t contain a spoken word by Delon or any other character. He stops Melville and says he’ll do it. Then he gestures to him to enter his bedroom. Delon then reveals a samurai sword mounted above his bed. One of cinema’s most handsome men, Delon displays himself impeccably here, almost emitting a poetic vibe in his every move and gesture. His portrayal of Jef conveys the confidence, solitude, and obedience of a samurai, but even more importantly, he remains an enigma, a shadow that seamlessly slips in and out of the dark waiting for his next duty. After Jef leaves his apartment he begins his process. He is on his way to do a hit. He received his information from someone who received it from a superior. He goes about everything properly: steals a car, gets the license plate changed, and slips into a jazz club hardly noticed. Once there he meets his target, the nightclub’s owner. Why does he kill him? Jef doesn’t ask questions. He just pulls the trigger. After killing him he leaves his office only to be confronted by Valerie (Cathy Rosier), the nightclub’s pianist. They lock eyes for a moment and they depart. Later on during questioning by an investigator (Francois Perier), Valerie denies ever seeing Jef. This encounter with Valerie is important. One reason is that Jef is recognized and is pulled in for questioning. Alibis have to be made with a close girl friend of his (Nathalie Delon, Alain’s wife at the time). This inconvenience causes Jef’s boss to begin to hunt him. The next reason the Valerie encounter is important is because we remember when Jef emerged from his funeral-like apartment he encounters Valerie briefly in a car next to him at a stoplight. Does Valerie represent death or fate? Soon, Jef will have to finally face her. She leads him to his final showdown. Or maybe he planned for it the entire time. When it came to crafting his films Melville was an absolute perfectionist. Everything is supposed to be right where it is. Melville is creating a sterile environment where the only thing that actually thrives is a man’s code and masculinity. Each specific color in the film is chosen to resemble particular moods. We are conscious of the cool, metallic lifeless hues of grey and blue that are evident in nearly every scene. The rare appearance of white is interpreted to be pure. One instance of this purity are Jef’s gloves he puts on just before using his pistol. It is almost as if Melville’s is saying you have to be pure and perfect to hold a gun. This is his samurai sword. Melville was hardly ever in favor with the over-saturation of trivial violence or bloodshed that contemporary crime films abide by; rather, he opted to relish the atmospheric dreamscapes that his characters occupy, focusing intently on what they are doing and thinking. 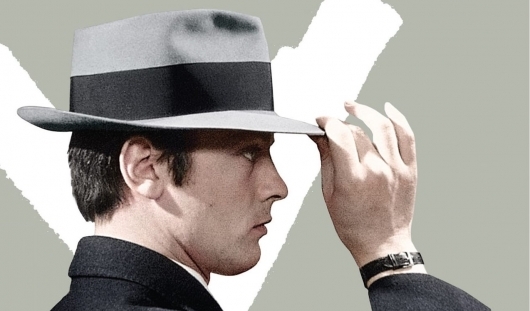 One could find a sense of detachment while watching Le Samouraï. There’s hardly any dialogue or what audiences may term “action-packed” sequences, but both are palpable throughout. Mood, setting, glances, gestures, and silence are an unconventional collection of unique, artistic ways that generate an engrossing depiction of what consummate genius looks like.